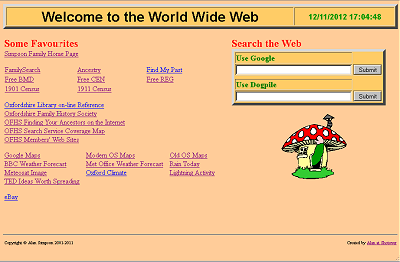 This page provides notes and links to accompany the talk on "Searching the Internet" given to the OFHS Computer Group meeting on August 6th 2001. It lists each of the search engines mentioned by the various speakers, together with some aids to make searching more user-friendly. A very comprehensive search engine. A quaintly named, meta-search engine. A search engine with a high UK content. Another comprehensive search engine, that seemed a bit more UK oriented. The only snag, it has gone! A search engine for UK genealogy sites. All have their own characteristics. Try them and see which ones suit you. Allow you to search for images of a specific subject. This is a relatively new innovation introduced by some of the search sites. You enter keywords as for any other search and the result is a set of thumbnail images that fit the words you have entered. Relevant pictures may be identified from their filenames, alternative captions, or text near to the picture on its original web site. The technology is quite new and is not yet as specific as normal text searching. However a demonstration looking for images of Iffley village produced a good number of accurate "hits". What words do I put in the search box? Usually the search engine will find any pages that include all the words you give it. So try to choose words which are likely to appear on pages you want, but will not all appear on pages that you don't want. If you want a specific phrase, enclose it in quotes. Some search engines will accept words like NOT, or the use of a "-" minus sign, to tell them to reject pages with certain words. For example with Google, using simpson -bart can be helpful, if it is references to "real" Simpsons you are after! Look at the "Advanced Search" facilities on your favourite search engine, to see what is available. Q. How do they know which sites to show me? They keep a large list of websites, indexed by keywords. If the words you put in match the keywords, you get shown the site. Q. What do they show me about the site? They will always show you the address of the site, together with some text to help you decide if your are really interested in it. Some search engines keep a small section of each page, usually near the top, and show you that. Others will keep a copy of the whole page and will show you a little bit of context around each of your keywords. Q. How do search engines find pages in the first place? They use devices known as spiders which spend all day exploring the web finding new pages to add to their databases and updating existing ones. Q. Do I have to pay to have my site listed? Q. Can I stop search engines finding my web site? You can include text in your pages to tell search engines to ignore them, but hey, you spent all that time creating your web site, why would you want to hide it! What are Cached web pages? Web pages change from time to time as their content is updated. This is particularly the case for news-based sites, which change their content daily. So the story that your search found, may no longer be on the site when you come to look at it. To overcome this, some of the larger search engines keep a complete copy of the page as it was when they indexed it, in a cache. By clicking on this Cache link, you can see the history version of the page, that contained the words you searched for. During the course of the meeting, we saw an example of this from the OFHS site, where the cached page at Google was one update behind the present page. Why do some Search Sites have a "Translate" link? Some search engines include a link to a translation site which is able to translate the content of any web page from one language to another. The translation is done completely automatically by software. It will not always be completely accurate, but is generally sufficiently good to get the overall sense of a page written in a foreign language. By way of example it was allowed to translate the OFHS "Members' Web Sites" page into french. Much of the translation was quite impressive but the attempts to translate some members' names into literal french were a source of some amusement! If you click on a link with the right mouse button, rather than your left button, you will get a menu of options. One of these is to open the linked page in a new window. This lets you go back to the search engine's list of found sites immediately, without needing to re-load the page. Even better you can go down the whole list, selecting possible sites of interest, each in its own page. By the time you have selected the last, the first one will be loaded ready to read. This technique works with all the major browsers. If you are using Internet Explorer, or Opera as your browser, hold the Shift Key down, whilst clicking the link with your left mouse button, and you will open the link in a new window without having to select this from an options menu. This does not appear to work with Netscape though. This can include data entry boxes, pointing directly to your favourite search engines. Make this your browser's "Home" page, if your ISP will let you. If not, add it to your favourites, so you can get at it easily. Putting a shortcut to this page, on your desktop, will let you start your browser with this page, even if your ISP has fixed things so your official "Home" page is at the ISP's site. Here is an example based on the page that Alan uses. Download it from http://www.shotover.org.uk/welcome.htm and give it a try. When you save a site that you use really often, in your favourites, tell your browser to make it available off line. This is particularly useful for sites like "Family Search" where the initial data-entry form is quite complicated, and slow to load. Saving a local copy means you don't have to wait for it to load each time you visit the site. Most people leave this set to the sites which Microsoft or their ISP put there. Much better to get rid of these and put your own, frequently used sites there. Then they are always just a single click away.